Hello from muggy, overcast, and yet still totally hip, Brooklyn! Our drive up yesterday was smooth sailing and we arrived at my cousin’s gorgeous apartment right on schedule. I am looking forward to a day of walking and sight-seeing and a night full of family celebrating my grandmother. Last week a reader asked me if I have a Kombucha recipe posted and I realized I don’t. 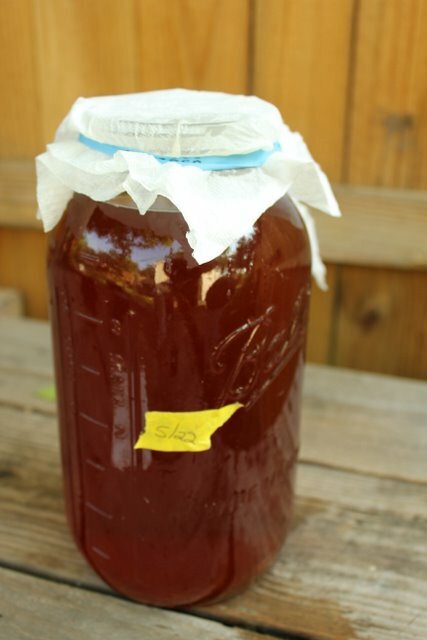 I’ve talked about making Kombucha many times but I haven’t written a step-by-step recipe. 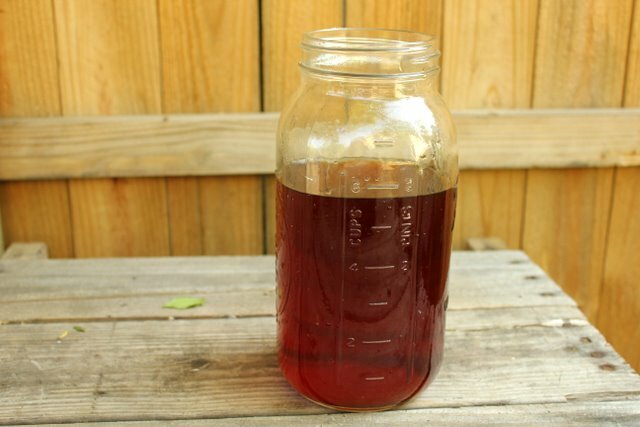 Kombucha, in theory, is very easy to make. In practice I find that every batch varies because the yeast and bacteria is very sensitive to temperature fluctuations, this is to say that every batch is different but most are great. Fill your jar with cold water, leaving about 2 cups worth of head space for the commercial tea you’ll add later, pour water into a large stainless steel pot, boil, turn off, add tea and sugar to pot. Stir to dissolve sugar and leave to steep for 15-20 minutes. Remove tea bags and allow to cool to room temperature (this will take a few hours). Once tea is cool, pour into your jar. Add the Kombucha to the cooled tea. NOTE: Kombucha is made from a culture of bacteria and yeast. This culture is very sensitive to metal. Never stir with or make contact with Kombucha and metal, from this point forward use wooden spoons to stir and taste. Cover jar with a clean napkin and rubber band and label your jar with the current date. Set jar in a dark, clean, out-of-the-way spot where it can sit undisturbed for 1-2 weeks. I use a section of our dish hutch as my Kombucha closet. After one week check on your tea. Peek under the napkin and see what’s developed. You are looking for the formation of a SCOBY (Symbiotic Colony of Bacteria and Yeast) on top of the tea. The SCOBY should be off-white and covering the entire top of the tea. Pour a little tea into a cup and taste it. It should no longer be sugary sweet, there should be a nice tang reminiscent of apple cider vinegar, and maybe a little effervescence. If it still tastes like sweet tea, re-cover and let sit for another 2-3 days. Retaste every few days until your desired tang is reached. 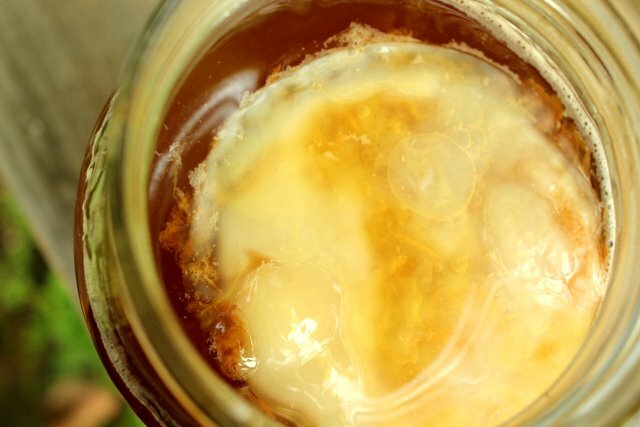 With clean hands, place the SCOBY into another clean glass jar with a few cups of your new Kombucha to cover it and set it aside*. Bottle your tea into clean, reused kombucha bottles or other empty, clean glass or plastic bottles, adding a splash of juice if you like and leaving a good inch or two of head room. Place bottles into fridge or back into room temperature storage. The Kombucha will continue to ferment and if stored at room temp will get more effervescent. Watch out for too much bubbly build up! Check the bottles every 2-3 days and when a nice amount of bubbles and good flavor is reached move to fridge to slow the fermentation. I drink 8-12 ounces before or after lunch about 5 days a week. *To make your second batch follow the same procedure EXCEPT for step three use your homemade Kombucha instead of store bought and add the SCOBY to the jar as well. It may seem a little complicated or time consuming but now that I am familiar with the process it takes me a total of about 10 working minutes to make a batch of Kombucha. 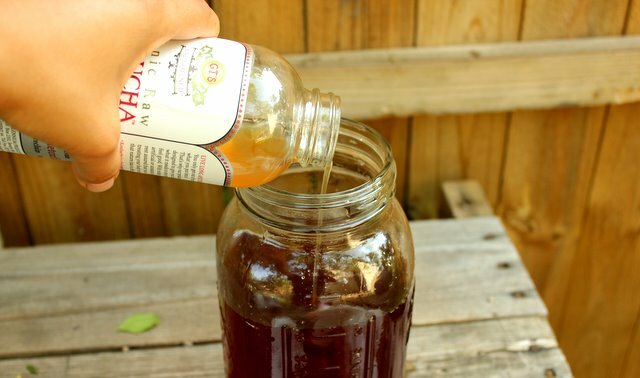 I DO NOT, however, recommend attempting to make this if you are not already a Kombucha convert. I admit it, Kombucha is weird stuff and if you aren’t already a big fan who is looking for an alternative to spending $4 a bottle than making it from scratch probably isn’t for you. Please comment with any questions you still have about Kombucha! I used to make my own Kombucha last year all the time. My MIL gave me the plant and I used it all summer. I do love homemade but there is still something missing that you can’t get from the bottled version. Oh well, it does save so much money to make your own. It’s definitely worth it. I am really excited about this! I just can not spend that kind of money regularly. This I can do though! Hi there..I love Kombucha! And I would love to make it myself. But I heard that there may be some health risks with the “scoby.” Like it could create bad bacteria that could make you sick. Is that just an old wive’s tale? Kombucha is a living, fermented food product and as such is subject to going “off”. In a healthy batch of tea the acetic acid inhibits bad bacterial growth and keeps the tea within a healthy PH balance. It is important to keep the tea covered as it cools, use clean utensils, and keep the kombucha covered as it ferments. If anything looks or smells off AT ALL (you know, besides the pungent, vinegary kombucha scent) then dump the batch and start over. In the research I’ve done I haven’t come across any cases of illness from drinking bad kombucha but I have dumped batches myself because they weren’t fermenting correctly. Hope that helps! Let me know if you have any more questions. Sarah, It’s really fun to make but be forewarned-it’s hard to replicate GT’s flavor and bubbliness. My homemade Kombucha is good and I may even prefer the taste of it now but it’s not the same. I have played with flavoring, I love adding chunks of peeled ginger or a splash of juice. The time to add flavor is either when you bottle it in smaller bottles or when it goes in the fridge. Good Morning~ your granola bars look really yummie on Kaths blog. WOuld you be willing to share the recipe? They were thrown together but I will try to make a recipe next week! They were REALLY good, my husband keeps asking “did I really eat the last one?” like I am holding out some secret stash on him! I just tried it for the first time a few months ago. I actually tried several different flavors to see which I liked. I must admit I wasn’t won over instantly. But, I am willing to train my palate for the amazing health benefits. 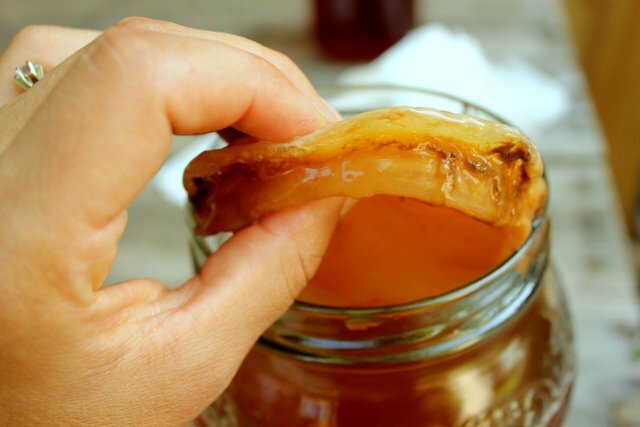 Is there a way to make the SCOBY from scratch….and also the kefir “soda” sounds very good but I cant find kefir water grains….what’s the difference between the ones for water or dairy, and can they be ordered online? The method I wrote about is basically from scratch because you don’t start with a formed SCOBY. I have no clue how you would truly start from scratch, as in without already fermented kombucha tea. As for kefir water grains, they can be purchased online at http://www.culturesforhealth.com. 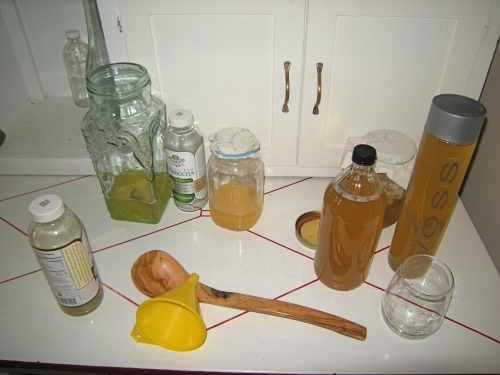 It is possible to make water kefir soda from the milk kefir grains but they will die out after a few batches instead of multiplying. Hope that helps! Can you share the granola bars that you made….over on Kath Eats? My friend and I totally improvised them so I don’t have a written recipe but I will do some experimenting (and record keeping!) next week and send along the results! I want to squish that scoby! Ok, but here is a comment/question. I have been hearing that innundating your body with this bacteria is unneccesary, and that the flora of a healthy gut does not require all of this added bacteria. In fact, because the yeast is not reactive specific, it has not been determined what exact bacterium you are growing and there is growing concern that regular kombucha drinkers may be becoming antibiotic resistant. Dr. Andrew Weil is against the stuff (but then I’m against Dr. Weil’s hugely expensive face creams, so there). Have you looked at this. Why do you think we need all this extra stuff, if you are healthy? Especially when it is grown from sugar and caffine? Just wondering..
GREAT comment Clare, thanks and sorry it’s taken me a while to respond-I’ve been offline for a few days. First the disclaimer; I have no medical background so everything I write about is what I know from personal research and experience. I have looked into the risks of kombucha and ultimately what I decided is that it makes me feel good and I have experienced a direct relief from stomach aches, headaches, and general malaise when I drink it. Fermented foods play an important role in our food history but lately everything has become more and more sterile (believe me, I know this is not necessarily a bad thing!) and it is less common to get the raw, fermented, probiotics in our diet. Since I have been consuming more fermented food over the last year I’ve had much less illness, perhaps a coincidence but I am willing to take the risk. I do think that it’s important to consume fermented food and beverage “medicinally”, I keep it to a conservative 8-12 ounces of kombucha 4-6 days a week. As for the sugar, my understanding is that the SCOBY feeds off of it and transforms it to glucuronic acid, glucon acid, acetic acid, lactic acid, vitamins, and amino acids, even so I still prefer to brew mine with organic and unbleached sugar. I don’t mind the caffeine, it’s a minimal amount and it’s an added little pick-me-up when I drink my after lunch dose. If you want to keep drinking kombucha but are concerned about the risk you probably want to leave the brewing to the experts. Thanks so much for sharing this! I’m kind of addicted to GTs and I would LOVE to make my own…It’s good to know it’s not impossible! I have been making my Kombucha with a combination of half regular green tea and half Ginger Peach Green tea bags (from the Republic of Tea) and the flavor is wonderful. I plan to begin experimenting with different organic flavors in addition to the basic green tea now that I have several healthy scoby’s. The main thing I have noticed since I started drinking kombucha is that the arthritis in my knees has just about gone away. Tate says it is due to the summer weather, but I noticed the improvement back when it was still cool and damp outside. My husband has some major pain in his joints from arthritis and he has just started drinking kombucha, so I’ll let you know if he gets the same results. There are many great sites on the internet that talk about the health benefits of kombucha too. Enjoy! Super excited to try this—this week! Thanks for posting this. I’m so addicted to G&T trilogy right now, but on a Grad School budget? Ugh. I have a good feeling this is the solution I’ve been looking for! I am drinking a glass of homemade Kombucha as I type this! I’ve changed three things about the way that I make it. First, I let it ferment on top of the hutch instead of in a cabinet because I heard that it prefers to have some air flow around it. Second, I use bottles with a two-piece flip lid (like the Grolsch beer bottles) when I bottle it because they hold in all the bubbles. Third, I always add a splash of juice when I bottle it to create more bubbles and better flavor. Also, you don’t need to buy a kit unless you really want too, my recipe used a bottle of commercial Kombucha as the starter. Enjoy and please let me know if you have any more questions! Thanks! The kit is on sale and comes with a SCOBYand a big jar (which I would need to buy anyways), so it seemed like the easiest way to go for now… I think I’ll do it! Thanks for leading me over here from Twitter! I had read about ordering SCOBY online…and that just weirded me out for some reason. Somehow the homemade process sounds a lot less scary when you use a bottle of brewed kombucha as starter for the SCOBY. I will definitely give this a try!